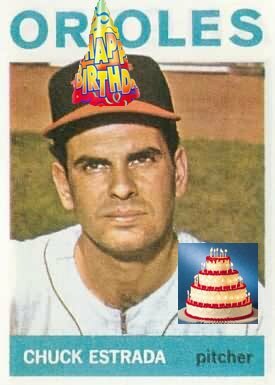 Happy Birthday to former Orioles pitcher Chuck Estrada who was born on Feb. 15, 1938. Estrada won 18 games for the Orioles during his rookie campaign in 1960, tops in the league that season and good for his first and only All Star appearance. Two years later he led the league in losses with 17. Estrada tied with teammate Jim Gentile for second place in the 1960 Rookie of the Year balloting. The Orioles claimed all three spots in that year’s voting with infielder Ron Hansen winning the award. Estrada was named Pitcher of the Year by The Sporting News, an award that in 2009 went to Zack Greinke (AL) and Tim Lincecum (NL). Estrada also played very briefly with the Cubs and Mets. Elbow problems that emerged in 1963 shortened the young pitcher’s promising career.